Today's hearing entertained two returning witnesses. In the morning Michel Descôteaux (spokesperson for Imperial Tobacco during the 1980s and 1990s) continued his testimony. In the afternoon Jean-Louis Mercier (president of Imperial Tobacco during the 1980s) returned to continue the testimony he started over April 18th and 19th. Both men settled into a groove of short answers (often a simple "no," or "I don't remember") and offered few new insights into how the company managed its affairs during their time as senior managers. The documents that were introduced during their testimony, however, shed more light into some of the "sub-plots" of the story of Big Tobacco in Canada. Yesterday, Mr. André Lespérance had indicated that there were a number of documents he wished to enter through Mr. Descôteaux , and this process consumed much of the morning session. While Mr. Descôteaux said little, the material tabled spoke volumes about the scope of his activities during his time at Imperial Tobacco. Mr. Descôteaux as clairvoyant. In 1986, he writes his boss, Mr. Mercier, to express concerns about the storm-clouds on the horizon. "I am now convinced that within two or there years, a new crisis will emerge heading towards sweeping federal laws on tobacco." (Exhibit 236). Mr. Descôteaux as strategist: In 1995, he writes the president of the CTMC, Mr. Rob Parker, to give his take on the priority issues that the industry must fight back. These are plain packaging, restrictions on sponsorship, litigation, smoking restrictions, restrictions on access to tobacco products, attacks on teh companeis, new tobacco legislation (especially fears for having tobacco included under the Hazardous Products Act), product and package modifications, increased government spending on tobacco control and higher taxes. (Exhibit 238). Mr. Descôteaux as global team player. 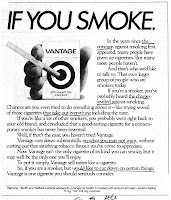 In the summer of 1994, he and Roger Ackman joined a select group of BAT executives to reflect on "what needs to be done to cause consumers, employees, the public at large, the media, governments, investors etc to adopt a balanced view of tobacco products similar to that held towards other products and services which when used entail the voluntary acceptance of risk." (Exhibit 242). Mr. Descôteaux as hall monitor. In May 1980, Mr. Descôteaux equivalent at IMASCO (Mr. Norm Dann) wrote to warn of a competitors advertisement, and to ask for intervention at the CTMC. (Exhibit 243 and 243A). No doubt you are on to this. But in case not it is a violation of the Industry agreement to refrain from having health or health-implied messages in the body copy of advertisements. They must be desperate. I think the Council should take it up or there will be a gradual T&N Numbers war in ads and the industry's relations will suffer. During her brief cross-examination of Mr. Descôteaux, Ms. Deborah Glendinning (on behalf of Imperial Tobacco) returned to a few elements of his testimony over 8 previous trialdays. In response to her questions, Mr. Descôôteaux confirmed that he had no responsibilities for the design of products, the research that was conducted, the marketing policies or the policies with respect to document retention/destruction. He answered her questions about whether he felt he had ever misled smokers or the public with respect to health risks or other issues with a firm "No." He was equally firm in his negative response about his view that the Smokers' Freedom Society had no real impact in improving the environment for smokers or opposing smoking bans. As for the long "think piece" on which he was questioned in the early days of his testimony (Exhibit 11), he agreed to her suggestions that it had never been intended to be circulated outside of the company, that he didn't know whether any of the ideas had been acted on by Mr. Kalhok. He volunteered that this essay was produced within a culture of open discussion at Imperial. And the materials he had sent to Alcan to discourage their anti-smoking program? Well, he wasn't sure that anything had gone beyond his contact, Jacques Gagnon, and thought that Alcan had not changed its policy in the end. One intriguing question put by Ms. Glendinning involved Imperial Tobacco's constitutional challenge of the 1988 Tobacco Products Control Act, which was the first federal law to authorize regulations on health warnings. She asked Mr. Descôteaux whether he recalled that health warnings were included in that challenge. He thought not. Intriguing because it was only last week that Imperial Tobacco launched a new constitutional challenge against the revision of health warnings that was regulated this fall and is coming into force this spring. (Imperial Tobacco also unsuccessfully sought an injunction against the first regulatory requirement for graphic health warnings in 2000). Intriguing also because, although Imperial Tobacco had not included health warnings in its original claim against the legislation, the industry encouraged the Supreme Court to knock down the health warnings as a form of "forced speech" as they were not attributed to Health Canada. 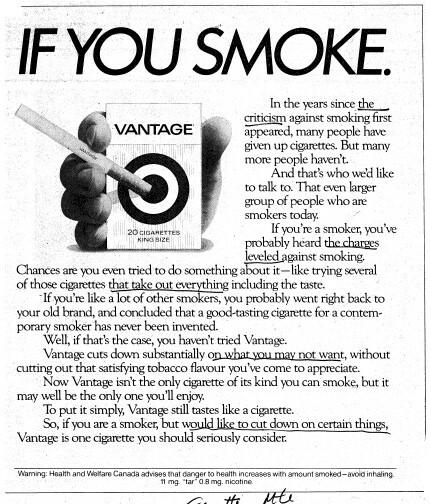 On one of her last questions, concerning whether Imperial Tobacco had ever made health claims about its products, Ms. Glendinning introduced one version of the voluntary advertising code agreed to by the Canadian manufacturers through the CTMC (a type of industry organization that absolutely existed in other areas of commerce, he agreed). The introduction of this document prompted Mr. Johnston, after some objections and discussions, to ask his own questions on re-examination and to touch on the inconsistencies between statements that said Imperial Tobacco always complied with a voluntary code that required that marketing not be to those under 18 and Mr. Descôteax's earlier statements that Imperial Tobacco used the legal age of smoking (16 years at that time) as a cut-off for marketing. When Mr. Mercier returned to the stand in the afternoon, Philippe Trudel picked up where the morning had left of with a discussion of the advertising code and Imperial Tobacco's adherence to its requirements to not market to people under 18, to exclude celebrity endorsements, and to limit advertising to brand preference and to ensure that advertising does not state or imply that smoking a particular brand is essential to romance, prominence, success or personal advancement. Mr. Mercier explained that festooning the uniform of racing heroes like Jacques Villeneuve did not constitute endorsements, nor did it market to youth and that lifestyle advertising was completely consistent with the voluntary code. But for the most part, his answers were short non-answers. What was "immediate vicinity" of a school in which space tobacco could not be advertised? Why say "don't inhale" in the voluntary health warning? Did he ever meet Mr. Bédard? What was the (UK pro-smoking organization) FOREST? I don't know. I can't say. Ask someone else. Among the documents which prompted these laconic responses were further details about the origin of the Smokers Freedom Society and the question of whether its genesis was from within the tobacco industry or from the imagination of Mr. Lemieux and Mr. Bédard. The smokers' rights group idea is still being pursued, following the two week visit of [UK-based pro-smoker spokesperson] Stephen Eyres to Canada last month. Eyres, by the way, found Canadians tame for the most part, and the non-argumentative approach of most of the journalists who interviewed him allowed him to get his points across. "[T]he SFS is essential. It constitutes a "morale" builder for those who enjoy smoking. It is a small voice that, in the middle of the thunderous cacophony of the antis' condemnations and pressure, maintains that it is o.k. to enjoy smoking, that smokers are not social lepers, that smokers do not kill innocent bystanders with their smoke, that they pay their way in terms of health costs, that they have rights too." Will a 'safer' cigarette ever see the light of Day?. Later in the afternoon, Mr. Trudel turned to the topic of "Project Day", and the attempts by Imperial Tobacco to persuade its principal (if indirect) shareholder to cooperate in a Fundamental Research program to try to develop a "safer" cigarette. "To work towards the discovery of a 'safe' cigarette, 'safe' in the eyes of those who say that the current cigarette is 'unsafe' .' Such an objective is, in ITL' s view, market oriented (in that it would expand the market) but is not marketing-oriented, i.e. concerned with short term targets." As he had in his earlier testimony, Mr. Mercier insisted that there was no inconsistency in accepting the views of others that cigarettes were not safe and acting on the views that cigarettes were not safe while taking no position. "Were the existing cigarettes safe or unsafe?" asked Mr. Trudel. "We had no position," Mr. Mercier replied. He said that the launching pad for the idea was the Surgeon General's report that identified certain substances as being hazardous. "I am not a scientist. For me it seemed simple. Take a cigarette, analyze the smoke and figure out where the problem is. What is difficult is eliminating the problem." (EMN stood for Eliminate, Modify, Neutralize). Within 6 months, BAT had poured cold water all over the idea. Mr. Mercier described the head of BAT's holding company, Patrick Sheehy, as the "chairman of chairmen - the highest level" officer in the BAT family. In December Mr. Sheehy wrote to the highest Canadian level - Purdy Crawford, president of IMASCO: (Exhibit 255A). "The BAT objective is and should be to make the whole subject of smoking acceptable to the authorities and to the public at large since this is the real challenge facing the industry. Not only do I believe that this is the right objective but I also believe that it is an achievable one." Three new documents popped up this morning in the ever-so-helpful database of the plaintiffs. They were separate rulings from Justice Riordan with respect to the industry motions to that were heard on April 17 and which proposed to knock three of the federal government's expert witnesses out of the trial. Justice Riordan disagreed with the companies, and found that Dr. Len Ritter's expert opinion (on toxicology) was within his competence, did not usurp the role of the judge and was relevant. Dr. Ritter's expert opinion stays. Justice Riordan disagreed with the companies, and found that Dr. Bill Farone's expertise in chemistry was relevant to Canada, even if most of his work had been in the United States. Dr. Farone's expert opinion stays. Justice Riordan agreed in part with the companies, but for somewhat different reasons than they presented, He ruled that much of Dr. David Burn's report was not relevant to the action in report. Dr. Burns' expert opinion must be rewritten with many sections removed to be acceptable. A new witness schedule that has been under active discussion has apparently still not been resolved. It now appears that Mr. Jean-Louis Mercier will testify for the remainder of tomorrow, Thursday May 3rd, and that Mr. Anthony Kalhok will appear next week, as will Mr. Ed Ricard. Mid-day, Mr. Trudel announced that Mr. Ackman had been served with subpoena to reappear.